IN modern-day sport, loyalty is a rare thing to find. Graham White is one exception to the rule after completing 50 consecutive seasons with Henley Hockey Club. 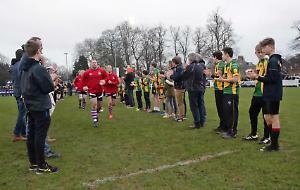 The 69-year-old, who is known as “Chalky” by his teammates, played his last competitive game for the club on Saturday as Henley’s fourth team beat Oxford’s ninth team 8-0. Chalky made his debut for the club in 1966 when he was 19 after discovering his love of the sport when he was a pupil at Henley Grammar School. He says: “I played at school and then went to a college. When I got back a year later I was living with my family in Nettlebed. Chalky then joined Henley, starting off in the third XI, which was then the bottom team. He recalls: “The following week they put me in the second team and the week after that they put me in the first team. “I found I was playing with a lot of my school friends from the team I had been in at Henley Grammar School. “When I first played it was down at Dry Leas where the rugby club is now. “They were grass pitches, we didn’t have AstroTurf. It was difficult to stop the ball and control it.” He played in the first team for about 20 years and captained the side for a couple of those. He then dropped down to the second XI, where he remained for 10 years and then played for the third and fourth teams. Chalky loves hockey, saying: “It’s a game of skill and trying to outwit the opposition and I find that challenge very enjoyable. I’ve been fortunate enough to be fit and injury-free to be able to do that for all these years. “I think I’ve contributed quite a bit — I was club treasurer for 25 years and led Sunday morning training. “I’ve seen a lot of players come and go and quite a few are still associated with the club. One or two I played with in the first week are still associated with the club. He says his proudest moment was winning the Hockey Association Trophy with the over-forties team in 2014. His guest appearance at the weekend was his only one this season following his move from his home of 42 years in Southview Avenue, Caversham, to Dane End in Hertfordshire last summer to be closer to family. “I came back for that game just so I could make sure I had my 50 seasons for Henley,” says Chalky. His team’s victory ensured Henley finished the season as champions of the MBBO Open League Division 9. Chalky says he has no intention of giving up hockey and he hopes to play for a team nearer his new home.